Mythos is the first choice of professional baristas worldwide. Mythos One is the new generation of on-demand coffee grinders with the highest level of technology and many smart devices to meet the needs of the most demanding barista. Mythos One stands out for its innovative Clima Pro technology and for it’s Clump Crusher system that ensures dose consistency and regularity. 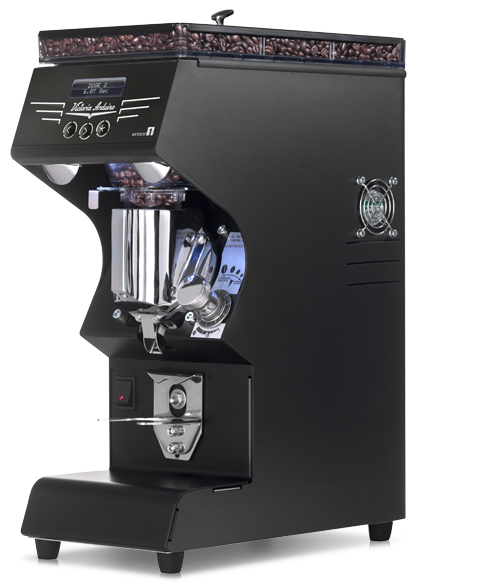 In the Mythos One on-demand coffee grinder innovative intelligent management of the grinding chamber temperature guarantees a constant dose therefore a better quality of espresso extraction. The grinding temperature has a great impact on the constancy of the dose. The Clima Pro technology manages the temperature in the milling chamber, using a cooling system that starts automatically as soon as the sensor detects the need. It is a simple solution, but one that brings great advantages for quality extraction. With stylish new innovations and an emphasis on producing the perfect grind, the Mythos One coffee grinder is a new generation grind on demand coffee grinder. Xtracted is proud to partner with Mythos for the distribution of the Mythos One coffee grinder, as they are one of the most sophisticated models available on the market. Feel free to take your time viewing the specifications of the Mythos One coffee grinder and contact our team of coffee lovers if you need any assistance regarding this wonderful model. As a specialist distributor of coffee machines and grinders, you can be sure that when you partner with Xtracted for your espresso equipment solution, you will be working with a team who cares about the quality of your equipment and coffee. We work very closely with the restaurants, cafes and coffee roasters we partner with to ensure that their machine is providing them with the best equipment solution for their business. At Xtracted, we care about coffee. Feel free to check out the Mythos One and our extended range of coffee grinders.